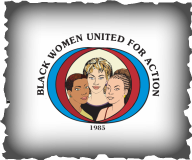 Twenty-fourteen marks the Twenty-ninth year of Black Women United for Action [BWUFA]. Little did I know that when we came together at the First Baptist Church, Vienna Va. late September 1985, that we as professional volunteers would make such a positive difference in the relatively short time. But then again, I should have known that those incredible founding visionary women, later joined by other dynamic, dedicated, and committed ladies would combine their excellent talents and skills to make a profound impact within our community. During BWUFA’s last few years, growth in every area of our development occurred mostly through the generosity of dedicated volunteers, contributions of office space through Unified Industries and other supportive measures provided by Christian Relief Services and Heritage Fellowship Church. BWUFA was awarded a small federal HUD grant for our adoption of an "at-risk" neighborhood that has been a marked achievement of our success. Our goal to strengthen our male resource volunteer pool has been extremely successful. Our short-term goals are to increase leverage with other BWUFA grants so that we can expand our offices' staff and become more innovative in our community outreach to be greater forces in the lives of "vulnerable" families. One of our major goals is to improve and enrich the lives of our youth. According to the photos on the cover, we are making some progress.